Twelfth Night Recap! — A.B.L.E. We hope you had a great Memorial Day and have had an awesome week. Five years ago, we staged our first Shakespeare play, Romeo & Juliet with an ensemble of 6 actors. Our audience of just over 60 people sat on metal folding chairs and bleachers in the Fasseas Studio at The Menomonee Club. It was a beautiful show and, even as we've watched our program grow to 12, 16, and now 20 actors, we could never have imagined all that happened last week. We are still buzzing from such a magical experience, and are excited to give you a behind the scenes look at our production of Twelfth Night! Our set up backstage. Everyone gets their own spot. Our teaching staff started arriving around 4:30 to get set up and do a walk through of the space. For our production, we worked around the existing set for CST's production of Tug of War, so had to get used to the scaffolding, where to make our entrances and exits, and how to maneuver the thrust. 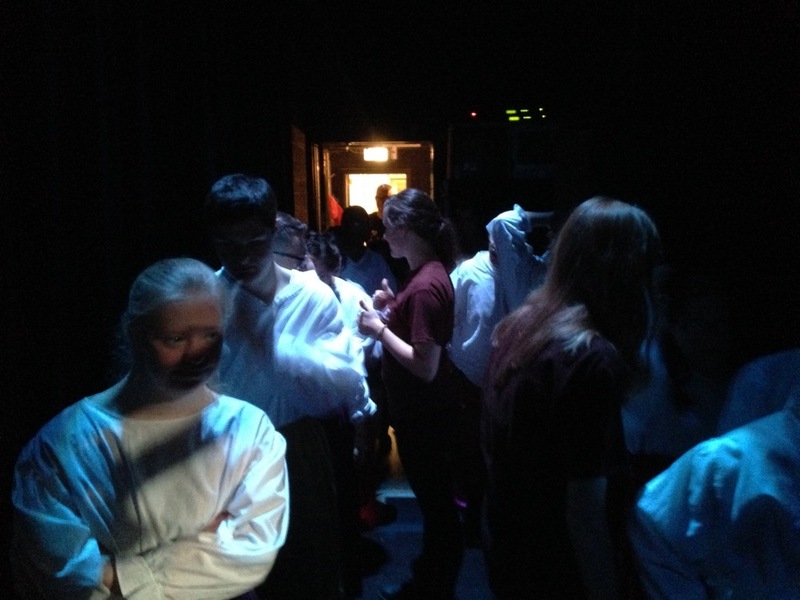 We worked out a few trouble spots, and also took time to set up the backstage area for our actors. At all of our performances, we set up chairs backstage for our actors. Everyone has an assigned seat with their headshot taped to the chair and their journal underneath. CST also provided us with a monitor so that actors could watch the show live on TV while they waited for their moment onstage! Everyone gathers onstage to warm up. As our actors arrived, we piled into the theater for warm-ups onstage and review of our very important ensemble rules: 1) Listen 2) Focus 3) Keep Your Hands to Yourself 4) Do Your Best 5) Have Fun! We also got to say hello to the CST staff and some other guests for the evening. Two big guests were Erin and Vikki from the Chicago Tribune. Erin took some fantastic photographs of our cast in action, and Vikki observed the rehearsal to write a story about A.B.L.E. for the paper (more on that later)! During down time backstage, our actors signed copies of The Complete Works. Every performer who is a part of Shakespeare 400 will sign these anthologies. 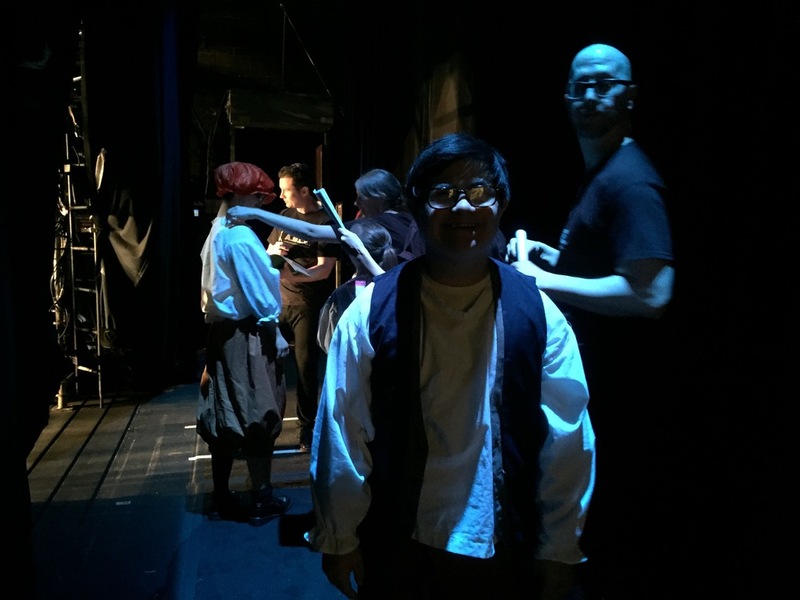 We reviewed blocking for Hey Ho and Sweet Viola first just to learn where our spots were and make sure we all knew how to handle those big group moments, and then we headed backstage to see the set up and get into costumes. Once dressed, we circled up backstage to do "I Take from the Heavens" and get ready to rock! Our run-through started at 6:30pm, and our goal was to get through as much as we could by 8pm. We did great! Naturally, this being our first time rehearsing all together and in a new space, we had a few stops and starts, but overall the rehearsal went very smoothly. The ensemble adapted quickly to the space and did a great job figuring out the stage and the different entrances and exits. We got through all but 15 pages of our 57 page script, and wrapped up around 7:50 to change and send the actors home. Our teaching staff packed up and spent about 30 minutes going through notes and doing some troubleshooting and then headed home for the night. actors in place and ready to start a run-through! We met back at Menomonee Club to continue working through scenes. Our teaching artists arrived a bit early to set up, go over additional notes, and re-block some scenes. The actors arrived at 6:30 and we kicked off our final dance party of the semester with some Justin Timberlake, and some Whip Nae Nae. Katie led us through a warm up and a quick check in and then we picked up where we left off on Monday. Andrew rocking the yellow stockings! This rehearsal was a little longer than usual, which gave us extra time to run through the scenes we didn't cover on Monday, and to clean up some tricky moments like the shipwreck, the duels, and the final scene. To finish out, Fletcher led us through "I Take from the Heavens" - his family is moving to Arizona this summer, so this was his last rehearsal with us. Once class was over, we celebrated with cupcakes and lots of hugs. In addition to the show, our teaching artists and ABLE co-founders Lawrence and Katie got married Friday morning, so there was lots to celebrate! Our fabulous facilitators and tremendous teaching artists! The fun started before we even got the theater, as everyone grabbed several copies of the Chicago Tribune to read the lovely article by Vikki Ortiz Healy. 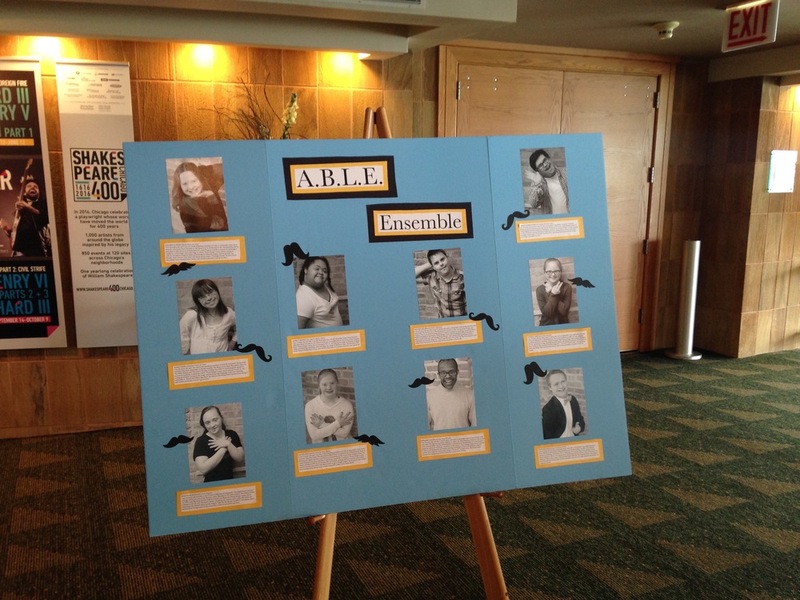 If you missed it, click here to read the piece, which gives a fabulous look at how A.B.L.E. started and what it means for the actors and their families. Our cast runs-through Sweet Viola before the house opens. 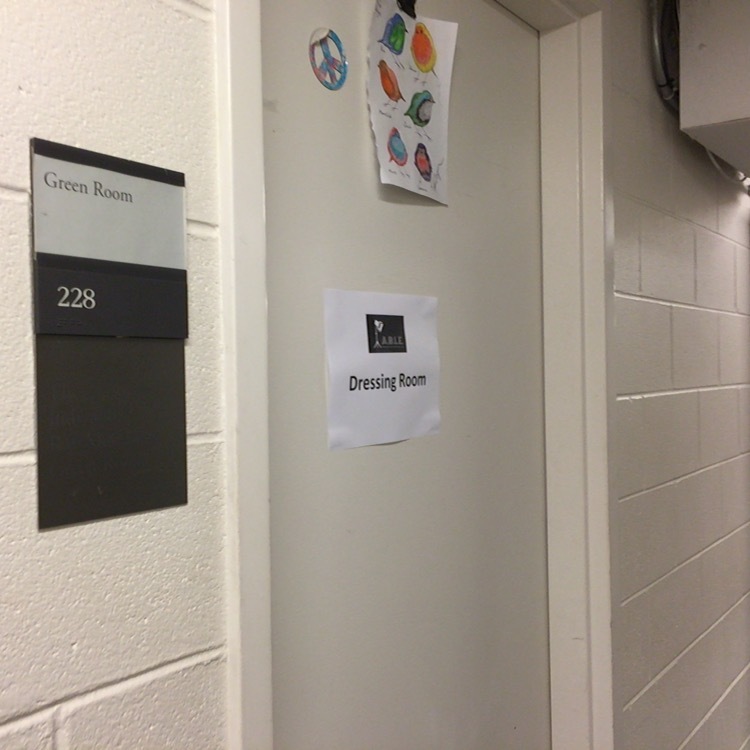 Our teaching staff was on site starting at 8:30 and got all of the costumes and the backstage area arranged. Around 9am, we started running through some trickier blocking and cleaning up moments that needed extra attention. The actors were all on-hand by 10am. We circled up onstage and did a group warm up getting our bodies and our voices going. From there, we rehearsed our big songs and went straight backstage for costumes, bathroom breaks and preps. The house opened at 10:30. We had 470 of the 500 seats reserved, and we could feel the excitement at the audience rolled in. If you've never been inside Chicago Shakespeare Theater, the space is truly beautiful. The lobby has floor to ceiling windows that look out over Lake Michigan and Navy Pier, and the theater itself is a beautiful Courtyard style space like the Swan Theater in Stratford. It's a magical theater, and you could hear the reactions of the crowd as they came in. We started on-time (that never happens!) with Founder and Director Katie Yohe giving a quick warm-up speech to the audience. She even had them practice "dropping in" to encourage them to turn off their cell phones and not to take photos or videos. And then it was time to roll! Peter introduced the story and the ensemble rolled onstage to huge applause to perform Sweet Viola. The show rolled pretty seamlessly from one scene to the next. Finding equal stage time for 20 actors meant that this was a longer show than some of our others - we clocked in at 1 hour and 40 minutes, but the actors showed great endurance and energy throughout. Everyone loved their moments onstage and added their own personalities to their characters. Quincy sang as Olivia, all of the Malvolios loved showing off their yellow stockings (Ben more than others), and Sam R was thrilled to play his ukulele and sing "What Makes You Beautiful" with the other revelers! There was lots of laughter, and also plenty of tears in the audience as our actors tackled this beautiful verse and complicated story. By the end of Hey Ho, the audience stood and clapped along and we bowed to a standing ovation! Mila, Jack, Quincy, and Marissa wait "on deck"
Samuel is ready for his turn as Malvolio! Malvolio putting on his stockings! Alena was an awesome officer! Thanks to Lindsay Stock for creating these displays. After bows, we recognized Rachel Buchanan. She has been with our ensemble since the very beginning and is graduating in just a few weeks. She will be attending college in the fall, and we presented her with a medal and a certificate listing all of her performances to commemorate her graduation! After we packed up and the audience trickled out, our teaching staff met on the rooftop of the theater for a champagne toast with CST's Director of Education, Marilyn. It was a perfectly beautiful day and we are beyond grateful for the tremendous opportunity, and humbled to see how much we've grown! Eric Van Tassell for being our lighting guru on this and so many shows. Our parent costume committee: Josh Radinsky, Julie Rowe, Eva Kwidzinski, Jo Dee Walsh for helping our ensemble look their best and get into character. Colleen Mastony at JTPR for taking such a passionate interest in our program and helping to get the word out about what we do. And last, but never least, the entire team at Chicago Shakespeare Theater for this incredible opportunity. Doreen, Marilyn, Jason, Sarah L, Sarah G., Hannah, Eric, and EVERYONE who welcomed our group with such excitement and professionalism. Newer PostActor Spotlight: EMILY K! Older PostActor Spotlight: EMILY L!